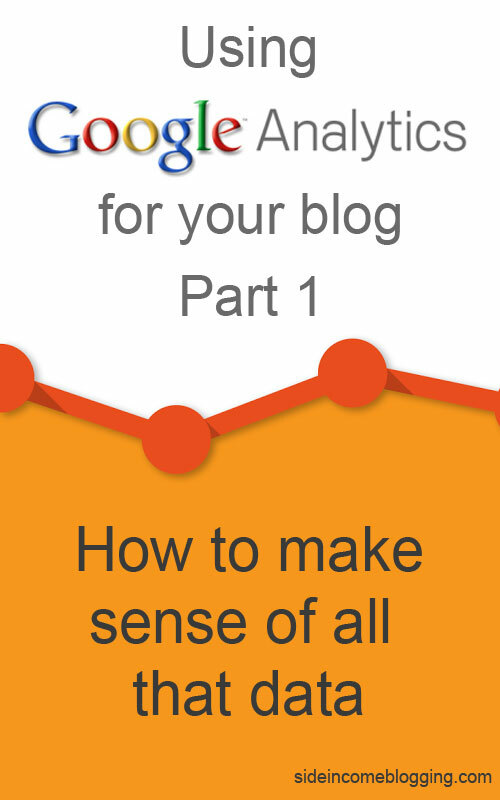 One of the key tools you should have set-up on your blog from day one is Google Analytics. Setting up Analytics is pretty simple, but understanding how to use it and all of the data it provides isn’t. I often receive questions like: How do I use Google Analytics? and I have analytics set-up, but have no idea what I’m looking at. Can you help me understand Google Analytics?. With those questions in mind, I thought I would put together a series that will overview what Google Analytics is, how Google Analytics works, overview each of he main Gooogle Analytics sections and discuss how you can use Google Analytics to build up your blog. This is the first of a series of articles that will address all of these topics, in detail for you. 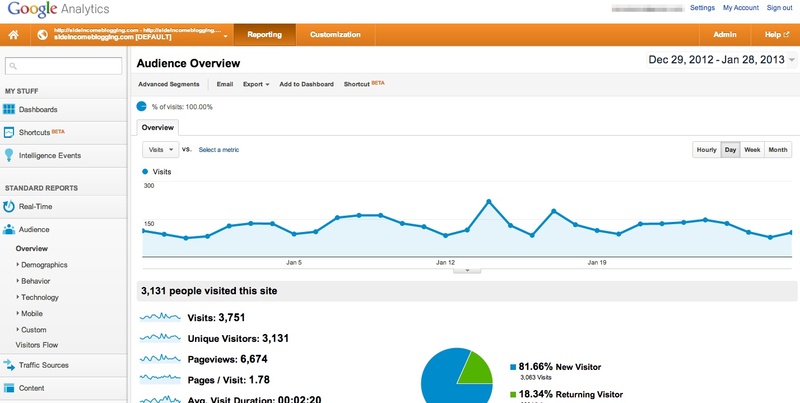 If you don’t currently have Google Analytics set-up and running, go ahead and add Google Analytics to your blog. No time like the present and by putting this off, you’re just missing out on collecting valuable data that will help improve your blog and understand your visitors usage patterns. Google Analytics is a web-based product provided by Google that allows you to view information about the traffic reaching your blog. Not only can you view information about your blog’s traffic, you can dive into great detail about it as well. Some of this detail can include things like: what type of browser your visitors are using, the type of computer, visitor language, originating country, mobile or non-mobile, flow diagrams showing he path visitors take when they visit you site…and well, the list just keeps going. I’ve been using Analytics on my sites since it first came out, and I still find new data and features all the time. Analytics is a pretty amazing piece of software. The best part about Google Analytics? Analytics is the defacto-standard for tracking website visitor information and it’s FREE – yes, zero cost and with no catch. There is simply no valid reason you shouldn’t be using it. Google Analytics works through a tracking script that you install on your blog. This script should be included in each of your blog pages and sends Google Analytics data about the visitors to your site to Google’s servers, where it is recorded. This script is installed to your blog, below the footer and just before the </body> tag. If you’re running Thesis, you can easily add the script by pasting it into the Stat and Tracking scripts textbox located in your WordPress admin console, under Thesis>>Site Options. This article series will guide you through the main areas of Analytics that most people use on a daily/weekly basis. Covering all of the various views and reports provided by Analytics would be far beyond the scope of this series, and would be enough for a large sized eBook. Navigate to Google Analytics (http://www.google.com/analytics/). Click on sign-in located in the top right corner. If you’re already signed in using your Google account, you’ll be sent right to Analytics. If not, you’ll need to enter your Google credentials. From the Accounts home page, select your website name, then select it again. I’m not sure why Analytics does this – Anyone know? Note: If you just set-up Analytics, you won’t have any data to to view yet. Just give it a day or two and then come back. This is the main page of Google Analytics and the default page you will always come to when you open Analytics for your blog. The Audience overview page provides you with a summary of your blog’s basic traffic. The first thing you should note is the timeframe, located in the top righthand corner. The default is the past 30 days, and does not include today. You can view today’s data, but you have to specifically include it in the date range. You can adjust this range to be whatever range you want. Generally I use the last 30 days, but it depends on what I’m looking for and will sometimes go back 90 days if looking at search traffic trends. The next and most important item on this page is the graph, which by default shows you visits to your blog for the last month. By default, each data point is a day (so visits for one day). You can change this by selecting a different value in the top right corner of the graph that shows: Hourly | Day | Week | Month. Generally you won’t change this, but if you want to see your traffic for a longer period of time, using the Month view is often better. Again, the graph shows visits. Visits (per Google) = A visit is a group of interactions that take place on your website within a given time frame. Here’s an example: I visit Side Income Blogging and land on the main page. I see an article I like, navigate to it and read it. At the bottom, I see a few relevant posts and click on one of them, read it as well and leave. That would count as one visit. You can also adjust this chart to show page views, by clicking on the drop down in the top left of the chart and selecting PageViews. PageViews (per Google) = Pageviews is the total number of pages viewed. Repeated views of a single page are counted. In the example I used above, while the visit count would be 1, the pageview count would be: 3. In general, you want to see your visit graph trending upwards over the long term. Mine, from the screenshot is only for 30 days, but is a little flatter than I would like to see it. I need to work on that, but it’s a good example of the type of valuable information Google Analytics provides. The section on the left show’s summary data about your site for the time period selected. Visits = The total number of visits over the past 30 days (or for the time period you have selected). Unique Visitors = The total number of unique visits over the past 30 days. As an example, if I visit Side Income Blogging multiple times in a 30 day period, my visits are only counted once in this metric; however, under Visits, they would be counted however many times I visited. Average Visit Duration = How long, on average, people that visited stayed on your site. Bounce Rate = Percentage of single page visits. In other words, this is the percentage of people that arrive on your site, view a page, then leave. Pages/Visit is a really good metric to use for understanding how far visitors are diving into your blog. You want this metric to be high, over 3-4. As you can see, Side Income Blogging is 1.78. I want this to be higher and I’ve been working on it. To increase this number, you have to offer your visitors more content options to click on. Thus, I’ve been adding more in article links, and adding other related posts to the bottom of my articles. I’ve seen it slowly trending upwards over the past few months. Average Visit Duration goes hand in hand with Pages/Visit. Again, you want this number to be high (over 2-3 minutes). The longer visitors are on your site, the more content they are reading and the higher change you have for them to signup for your mailing list, click on affilate offers or ads. My time is 2:20, which isn’t bad and a number I’m pretty happy with. Bounce Rate is a frequently discussed and high attention metric. Bounce rate tells you if people are finding what they are looking for or not. A high bounce rate would indicate that your blog isn’t “sticky”, meaning your content didn’t provide the visitor what they were looking for or did not appeal to them (read: poor quality). High Bounce Rate can also show you that you aren’t giving the visitor enough options for viewing other content on your blog or that you have links or ads taking viewers away from your site. The Average Bounce Rate for a blog should be around 70%. The average bounce rate for websites in general is 40% (per Google), but the average blog bounce rate tends to be a little higher. Why? Well, two fold really: 1) Blogs often have a high percentage of search engine visitors that are looking for an answer, they get it and move on and 2) Blogs often have a high percentage of regular readers that only come to read the latest article published, as they’ve already read previous articles. As you can see, mine is 74% and I’m happy with that. One interesting thing you can do, and I’ll discuss how to do that in one of the future articles in this series is to look at Visit Duration and bounce rate of specific articles. Articles with a low duration and high bounce rate are articles that need to be addressed. They are either poor quality or not addressing what the visitor is looking for. As I mentioned early on, Google Analytics is extremely comprehensive and as a result will take me some time to cover, even at an overview level. We’ve addressed the Audience Overview page and in upcoming articles in this series, I’ll discuss the other main Google Analytics sections: Traffic Sources and Content. I’ll also discuss how to use all of this data to monitor and improve your blog. So stay tuned! Hi Larry. I have a question. I just started blogging with blogger. In my account there is blogger stats. I click on it and it has an overview of my traffic for my posts with a graph, audience, traffic source, etc. It shows I am getting pageviews (small, but I’m working on it!) 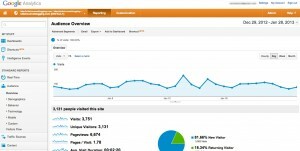 Do I still need google analytics? I signed up for analytics and it shows zero traffic to my blog. I am so confused. This is a second language to me. I love your newsletters! Hey Cortne – thanks for all of your comments – I LOVE getting comments. The only thing better is questions! Blogger provides some really good analytics built in and some of the data overlaps, but Analytics will give you additional data and reporting features that the base blogger analytics don’t provide. I would suggest going ahead and adding the scripts for Google Analytics. It won’t slow your site down, and you can use the built in Blogger analytics until you find they aren’t giving you what the need. When that happens, you can head over to Analytics and you’ll have been capturing historical data if you need it.